(Rick Egan | The Salt Lake Tribune) Three of the four spikes used at the ceremonial completion of the transcontinental railroad in 1869 are on display at the Utah Museum of Fine Arts in their first reunion since the celebration. Every summer, from Memorial Day to Labor Day, thousands of people attend re-enactments of the completion of the transcontinental railroad at Utah’s Golden Spike National Historic Site at Promontory Summit. The spikes they use, of course, are also re-creations. Two of the actual, ceremonial spikes from 1869, including the famous gold one, have been on display at the Cantor Arts Center at Stanford University in Palo Alto, Calif.; the third at the Museum of the City of New York. But now, for the first time in a century and a half, the three ceremonial spikes have reunited, and they’re on tour. Next stop: the Utah Museum of Fine Arts on the campus of the University of Utah. 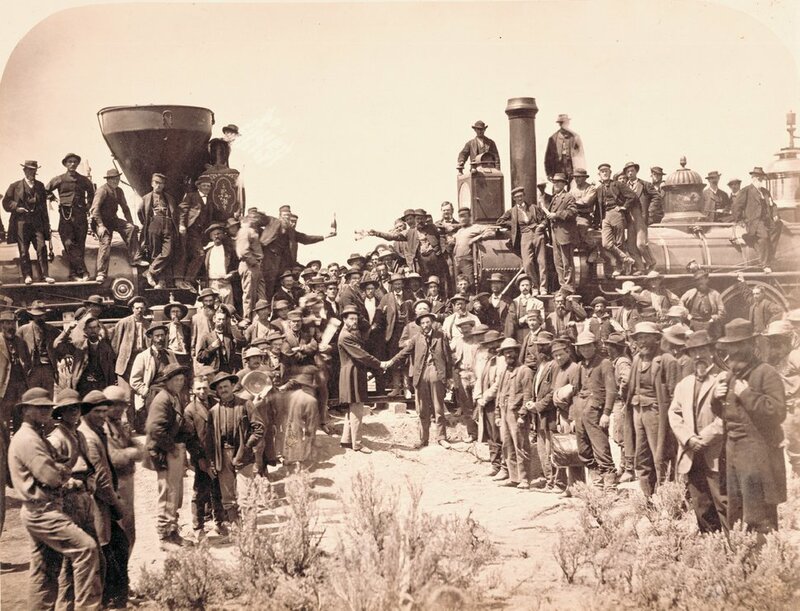 As the 150th anniversary of the big day — May 10, 1869 — approaches, the spikes are headlining an exhibit titled “The Race to Promontory: The Transcontinental Railroad and the American West,” which opens to the public on Friday. “This is the first time of course that they’ve been reunited in Utah since the ceremony back in 1869,” said Leslie Anderson, UMFA’s curator of European, American and regional art. “These are kind of the crown jewels of railroading,” said Patricia LaBounty, collections manager at the Union Pacific Railroad Museum in Omaha, Neb. “And I’d like to dispel the myth that they were driven. They were gently tapped” into pre-drilled holes, because gold and silver are soft metals. • The Nevada Spike, which was forged from silver mined in that state. • And the world-famous Golden Spike (aka the Last Spike), which is engraved on all four sides — the names of various dignitaries on two sides; “May God continue the unity of our Country, as this Railroad unites the two great Oceans of the world” on another; and “The Pacific Railroad ground broken January 8, 1863, and completed May 8, 1869” on the last. That turned out to be wrong. Union Pacific's vice president, Thomas Durant, was “hijacked by UP employees in eastern Wyoming and held for ransom, essentially, because they wanted to get paid,” LaBounty said, delaying his arrival and the ceremony by two days. There’s some doubt about the truth of that story. Whatever the case, May 10 is marked as the date the railroad was completed. All three spikes will be at the UMFA through April, then move to the Utah Capitol May 8-12. The UMFA exhibit includes 150 photographs and stereographs by Andrew Joseph Russell, who photographed the construction from the Union Pacific/eastern side, and Alfred A. Hart, who photographed the Central Pacific/western side in 1868-69. There were actually four ceremonial spikes back in 1969 at Promontory Point, but it’s “unclear what became of the fourth one. It’s the lost spike,” Anderson said. • “Promontory Perspectives: A Faculty Conversation,” Wednesday, March 6, 7 p.m., Katherine W. and Ezekiel R. Dumke Jr. Auditorium — University of Utah faculty members will examine the significance of this historical event. Panel will include Paisley Rekdal, Utah poet laureate and professor of English; Gregory Smoak, director, American West Center and associate professor of history; and Matthew Basso, associate professor of gender studies and history. Q&A will follow. • “Railroad Stories: Community Voices and Regional Perspectives,” Saturday, March 20, 6:30 p.m. Katherine W. and Ezekiel R. Dumke Jr. Auditorium — The panelists include Katherine Kitterman, historical director, Better Days 2020; Darren Parry, chairman of the Northwestern Band of the Shoshone Nation; Michael Kwan, president of the Chinese Railroad Workers Descendants Association; and Fred E. Woods, professor of church history and doctrine at BYU. • “Charles Savage: Pioneer(ing) Photographer,” Wednesday, April 10, 7 p.m., Katherine W. and Ezekiel R. Dumke Jr. Auditorium — Leslie Anderson, UMFA’s curator of European, American and regional art, profiles Charles Roscoe Savage (1832-1909), who recorded the construction of the Union Pacific line in Utah. • “Working on the Railroad: Chinese Workers and America’s First Transcontinental Line,” Wednesday, May 8, 7 p.m. — Drawing on years of research, Chang — the Olive H. Palmer Professor in Humanities at Stanford University — presents the most documented account of this history.